Hello rhubarb lovers! 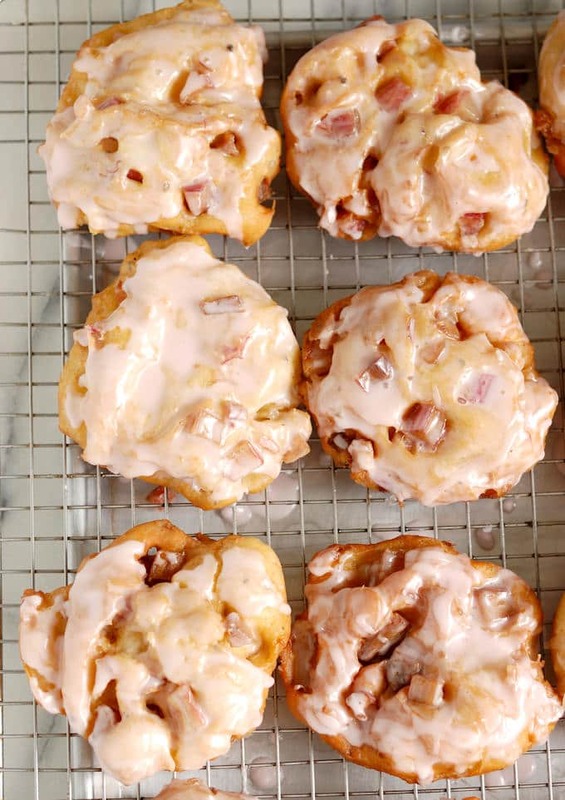 Are you ready for Rhubarb Fritters? Chunks of fresh rhubarb are embedded in a sweet, yeasty dough which is spiced with cardamom & Grains of Paradise. The fritters are fried until golden brown and iced with a glaze made from the rhubarb juice. Yummm! Admittedly this is not exactly a diet-friendly recipe. But it is definitely a taste-bud friendly recipe. 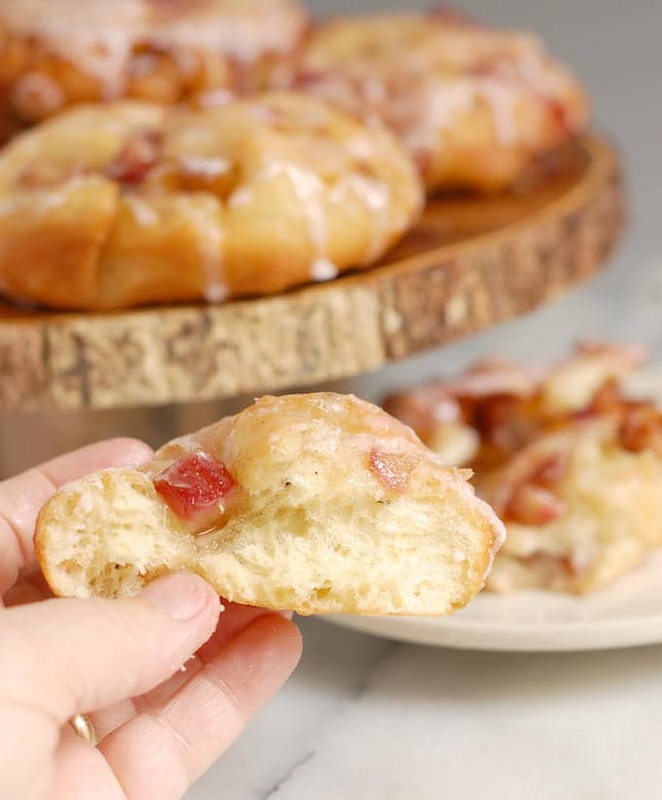 When you’re ready for a cheat day I suggest you make Rhubarb Fritters for breakfast, brunch or for a snack. But hurry, the season for rhubarb is winding down (at least in my neck of the woods it is). 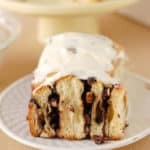 This recipe is inspired by Britton’s Bakery in Wildwood Crest NJ. Whenever I’m in Wildwood Crest I stop by Britton’s on the way into town to pick up a big box of donuts. The donuts are delicious, but the Apple Fritters are legendary, and they’re worth each and every calorie. I had an itch for fritters, and since I didn’t want to drive all the way to Wildwood I created my own recipe. I wanted a fritter that reminded me of Britton’s fritters. These are not the type of fritter made with a pancake batter. 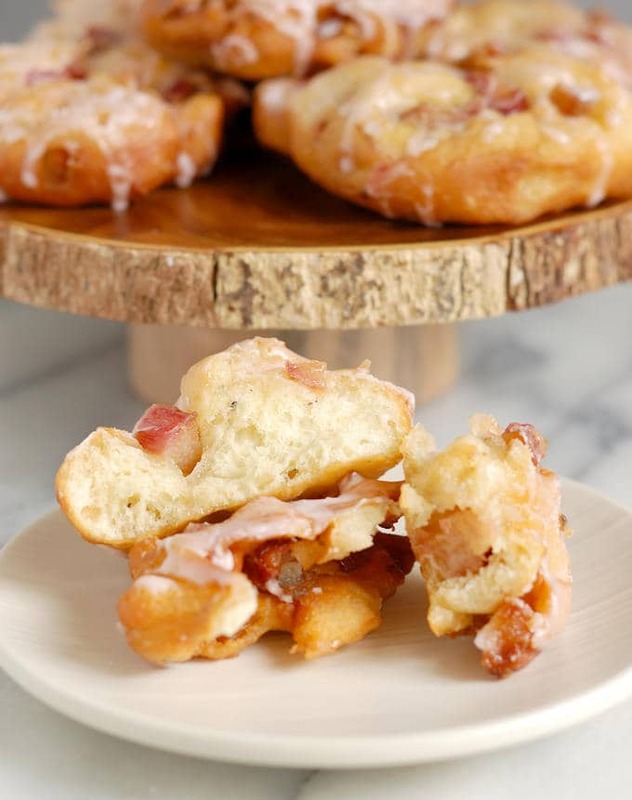 Like the Britton apple fritters, my rhubarb fritters are big, yeasty, donut-type confections. Now listen, I know we bakers can sometimes be perfectionists, but fritter making is not the time to get too fussy. These are supposed to be big, glorious blobs of messy, fried-dough heaven. When you’re working with the dough don’t be too precious with it. If some of the fruit falls out while shaping the fritters simply shove it back into the dough. If some fritters have way more fruit than others, just pluck out chunks from the full fritters and shove them into the skimpy ones. Even if it seems that the fritters will never hold together in the fryer, they will. The dough will puff up and trap the chunks of fruit. And remember, if you’re ever down the Jersey shore run, don’t walk, to Britton’s and indulge in a legendary apple fritter. Watch the recipe video to see how to make delicious Rhubarb Fritters. Chunks of fresh rhubarb are embedded in a sweet, yeasty dough which is spiced with cardamom & Grains of Paradise. The fritters are fried until golden brown and iced with a glaze made from the rhubarb juice. Whisk together 2 cups of the flour, baking soda, salt and spices. Set aside. Combine the buttermilk, melted butter, eggs, sugar and yeast in a mixer bowl. Mix with the paddle or beater until combined. (Or mix by hand). Add the dry ingredients and mix for 1 minute until it forms a thick batter. Switch to the dough hook. Add enough of the remaining flour until the dough gathers on the hook and begins to clear the sides of the bowl. Knead the dough on the mixer for 5 minutes. Sprinkle more flour if the dough begins to stick to the sides of the bowl. If working by hand add as much of the flour as you can with a wooden spoon then knead in the remaining flour by hand. Turn the dough out onto a well floured surface and knead until the dough is smooth, supple and not sticky. Use a little more flour as needed. Form the dough into a smooth ball and place it into a lightly oiled bowl, turning once to coat the dough. Cover with plastic wrap and set aside until doubled in volume (about 1 - 1 1/2 hours). Toss the diced rhubarb with the sugar and salt, allow to macerate for at least 60 minutes. Drain the juice from the rhubarb into a small pot. Cook the rhubarb juice over medium low heat until the sugar is melted. 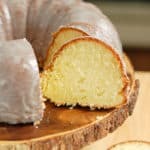 Combine the powdered sugar with the lemon juice, add enough of the rhubarb juice to form a glaze that has the consistency of thin pancake batter. 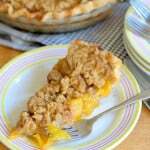 You can use a little extra lemon juice if you run out of rhubarb juice and the glaze is still too thick. Turn the dough out onto a floured surface and knead into a smooth ball. Roll to a 16" x 12" rectangle. 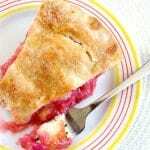 Distribute 2/3 the rhubarb evenly over 1/2 the surface of the dough. Fold the dough over the rhubarb. 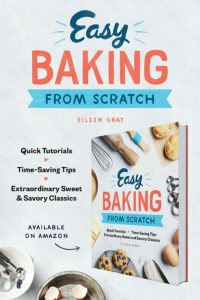 Gently press with your hands or rolling pin until the roll is flattened to 1" thick and the rhubarb is embedded in the dough. If you get air bubbles just poke the dough with the tip of a knife to release the trapped air. Scatter the remaining rhubarb over 1/2 the dough and fold in half again. Flatten to embed the rhubarb into the dough and form into a 12" x 3" log. Use a bench scraper to cut into 12 even pieces. 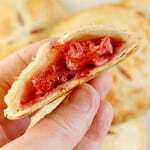 Use your hands to pinch each piece of dough into a rough disc shape, and to contain the rhubarb. If some pieces of rhubarb fall out, push them back into the dough. Don't worry if they're not perfect, they aren't supposed to be. 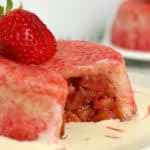 If some fritters have too much rhubarb and some have too little simply pluck pieces of rhubarb out of one and push it into the other. Place on a silpat or parchment lined sheet pan dusted with flour. Cover and allow to rise until almost doubled, about 1 hour. The fritters should feel light and puffy. When you poke the dough with the tip of your finger the dent should slowly fill in. If it bounces right back it's not ready. Meanwhile, heat 2 quarts of oil to 350°F in a large Dutch oven. Fry the fritters a couple at a time, about 4-5 minutes per side. Drain on a cooling rack while continuing to fry the rest of the fritters. While the fritters are still slightly warm dip the top of each fritter into the glaze and return to the cooling rack to set the glaze. Best eaten warm or within a couple of hours of frying. Grains of Paradise have a specific flavor with a peppery bite that goes well with fruit. I use a mortar and pestle to crush the grains. If you have a Spice or pepper grinder you can use that. Black Pepper can be used in place of the Grains of Paradise or omit the spice all together. 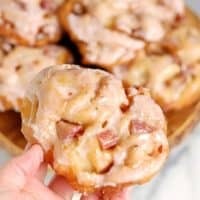 I’ve never heard of rhubarb fritters but I’d certainly love to taste them! 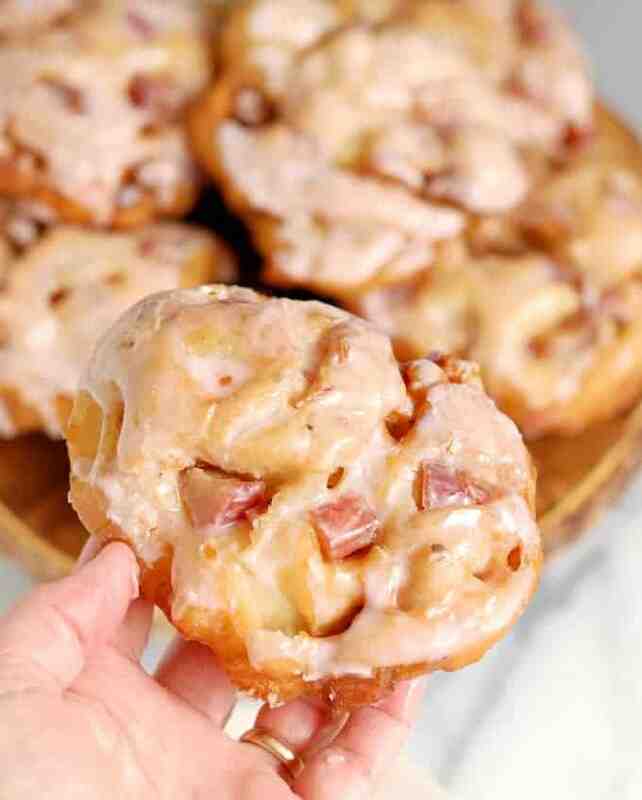 Usually, I see rhubarb used with pies and I don’t normally eat pies but I’d love to make and eat these fritters. It looks like we have the same eating interests. 🙂 You have a very nice blog!!!!! Thanks, Marisa. They’re a bit of an indulgence, but totally worth it. 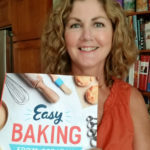 I learn so much about baking anytime I visit your site! 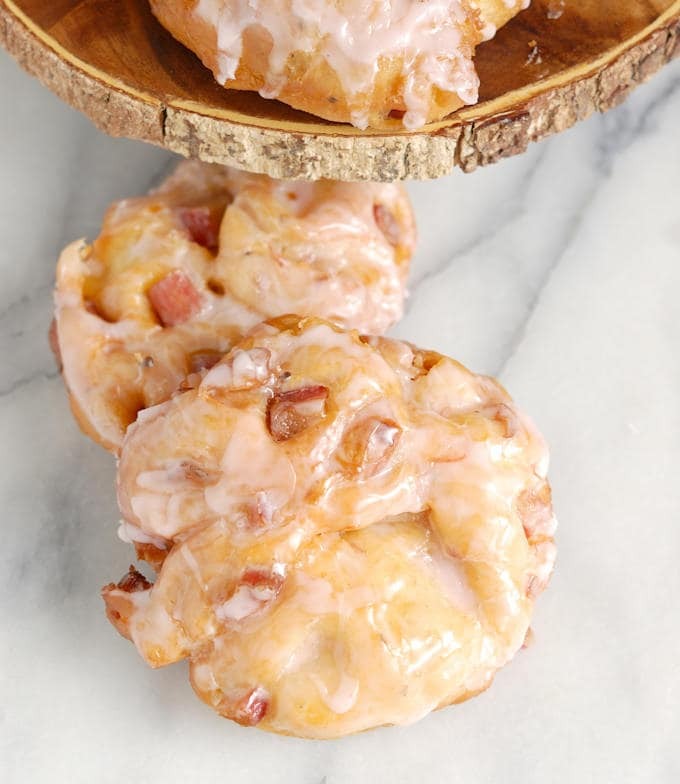 These Rhubarb fritters look so delicious, and I would love so much to try them.